After 15 years of pipeline welding across the United States, Canada, and Europe, Potter Bowles returned to the mid-west and opened Bowles Construction Company, an underground utility construction firm. In the last 30 years, B.C.C. 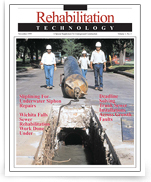 has grown to include all of the latest technology including the new “trenchless” form of underground pipe work. B.C.C. has performed private, local, state, and federal government projects including City and State Municipalities, DOD, and Corps of Engineers projects.